Aizawl, Nov 16 : The Mizoram government's flagship project New Land Use Policy will cover all the targeted 12.2 lakh families before the end of 2013, Chief Minister Lal Thanhawla said today. Lal Thanhawla was distributing first installment of centrally-sponsored housing fund to 136 families at Serchhip town, the capital of his traditional constituency today when he said this. "The NLUP, that aims to uplift the poor, is going at a good pace. As of now, 90,000 families have been covered, and another 32,000 families will be covered before the end of this five-year term," he said. Formed in December 2008, the Lal Thanhawla-led Congress government is to finish the term next year. 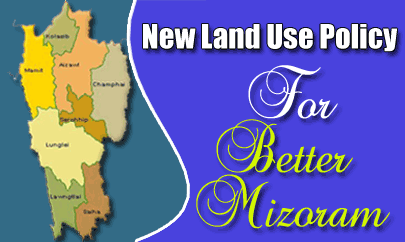 The chief minister further stated that the Integrated Housing & Slum Development Programme (IHSDP), under the JNNURM, implemented in the state by the Urban Development and Poverty Alleviation Department, has provided housing fund to 1950 economically backward families in the six district headquarters of Mizoram. Of these, 1231 families have received the fund and the last batch of 719 families are being covered in this phase. According to official sources, the central government has allocated Rs 710.41 lakh under the IHSDP for Serchhip district capital alone for construction of houses for 350 families. While construction of houses for 177 families have been completed while those for 37 families are being constructed. Rs 1,57,888 is allocated for each family, given in four installments. The first and second installments of Rs 59,000 each are meant for purchasing housing materials, and the third installment of Rs 29,888 for painting. The last installment of Rs 10,000 is for security. Of the entire amount, Rs 6,000 is the beneficiary's contribution. Each house should be constructed in Assam-type measuring not less than 39 square metres.